When ordering a replacement watch strap, there are two measurements that should be taken in to consideration. First is the width of the strap where it fits the watch and the second is determining the length strap required. 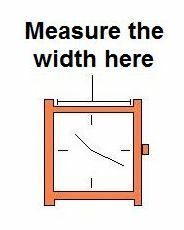 Measure between the lugs of the watch in millimetres (mm) as shown below. The measurement should be an even number, if not we recommend you round up. For example if the measurement is 19mm order a 20mm strap. Normally the measurement should range between 8mm and 30mm. To find the straps available in your size, simply use our search box at the top of the page or browse our site. Using the above details, measure your existing watch strap and match which length strap you need. If you do not have a watch strap to measure against, measure the circumference of your wrist. When working out which length you need, remember to add on the size of your watch to the above measurements. *Due to tolerances in manufacturing, the size of the watch strap received may be +/- 5mm the measurement shown. In most circumstances, this should not affect the length watch strap required.